It's here, the holiday season. You know what that means Christmas Shopping, holiday movies and Christmas baking. For me the holidays just wouldn't be the same without making a big batch of Chex Mix. I remember mom making a batch of the Original Chex Mix every Christmas. A lot has changed since then. Now when it comes to Chex mix there are so many flavor combinations to choose from. They're perfect for holiday parties and especially great for gift gift giving. I love making different varieties and then sharing them with friends and family. A couple weeks ago, the nice folks over at Chex contacted me to see if I would like to create their new Holiday Cookie - Inspired Chex Mixes. The new holiday chex mix varieties are microwavable recipes and ready in just 15 minutes. Making them perfect for last minute gift ideas. Today I'm sharing two of the cookie-inspired recipes, Peanut Butter Blossoms & Sweet Pecan. By far our favorite was the Sweet Pecan. It tasted just like butter pecan. I will definetly be making that one again before Christmas. Below you will find the rest of the Holiday Cookie Inspired Chex Mix recipes. Gingerbread Chex Party Mix – The combination of molasses, ground cinnamon, cinnamon candy and ground ginger make this the easiest, most gingery gingerbread recipe yet. Iced Pumpkin Chex Party Mix – Right down to the rich white chocolate cream cheese icing on top, your favorite fall dessert recipe is now a quick and easy snack mix. The Iced Pumpkin & Sugar Cookie are next on my list to bake. Measure cereal, pretzels and pecans in large microwaveable bowl. Line cookie sheet with waxed paper or foil. In 2-cup microwavable measuring cup, microwave butter uncovered on High 30 seconds or until melted. Add sugar and maple syrup; microwave uncovered on High 30 seconds, until mixture is boiling. Stir in vanilla. Pour over cereal and pecans, stirring until evenly coated. Microwave uncovered on High 3-4 minutes, stirring every minute. Spread on waxed paper or foil. Store tightly covered. Oven Baked Method: Preheat oven to 350 degrees. Line cookie sheet with waxed paper or foil. Spread the cereal and pretzels out onto the baking sheet. In a medium size saucepan melt the butter, brown sugar and maple syrup together. Bring the mixture to a boil. Remove from heat, add the vanilla extract. Pour the mixture over the cereal mixture stirring until the cereal is coated. Place the baking pan in the oven and bake the cereal mixture for 30 minutes, stirring the mixture every 15 minutes. Remove from oven and let cool. Break into pieces and store tightly covered. In 2-cup microwavable measuring cup, microwave butter, peanut butter and brown sugar on High about 1-2 minutes, stirring after 1 minute, until mixture is boiling. Pour over cereal, stirring until evenly coated. Microwave uncovered on High 4 minutes, stirring and scraping bowl every minute. Microwave uncovered on High 2 more minutes, just until cereal begins to brown. Immediately stir in half of the chips; cool 5 minutes, stir in remaining chips. Spread on waxed paper to cool. Place in festive Ziploc Brand containers and bags to share with family and friends! Hi Tina, and Merry Christmas! I'd try the Sweet Pecan Chex Mix first, cause I'm just nutty I guess. Thanks for the chance to win the cool gift, stay blessed! I also like the Sweet Pecan Chex Mix. I have fresh pecans and I think it sounds really good. The pecan one sounds amazing! I think I would do that one first. YUMMY! Thank you and Merry Christmas! What a wonderful prize. I would want to make the Sweet Pecan Chex Mix. It looks scrumptious. Merry Christmas!! Definitely the peanut butter blossom, my husband will love that!! I would definitely make the peanut butter blossom and the sugar cookie chex mix.Merry christmas to you all!! The sweet pecan Chex mix sounds wonderful! Thank you for your site. Love it! I'd make the sugar cookie chex mix. The Sweet Pecan looks yummy. I've been craving Cinnamon Sugar Roasted Pecans but this may hit the spot. Or maybe I'll combine them. t butter blossom chex mix. Oh Gosh! I love chex mix! I'll be making BOTH and the regular kind. Oh delicious looking! I would make the Sweet Pecan Chex Mix first but most likely do both as these are some of our favorite type snacks! Have a Merry Christmas! I would make the pecan for my husband, and the peanut butter for the g-kids!!! Merry Christmas!! Difinately sweet pecan, then the sugar cookie one. I like Chex just by itself too! I love pumpkin so the Iced Pumpkin Chex Party Mix sounds so so so good to me. I'm going to try the Sweet Pecan Chex Mix, sounds delicious! I would have to try the Gingerbread one! It sounds great, and I bet it smells great, too! Can't wait to make the peanut butter version for our office christmas party tomorrow! I try them all, but I am guessing Iced Pumpkin will be MY favorite! I'd make Peanut Butter Blossoms for sure. My gang is a huge peanut butter lover. What a great giveaway! I would start out with the Sugar cookie recipe first and then do the others. Chex Mix is a HUGE hit in my house -- Muddy buddies for my girls; Original for my son. YUMMY! Peanut butter and Chex!! I think the peanut butter blossoms sound awesome! I would definitely make the peanut blossom chex mix!! I would make the iced pumpkin chex mix! I'd make the gingerbread one because I've never heard of it! We always make the original CHEX MIX! The peanut butter sounds delicious...I think I might try that one! I know I will end up making all of them.....they sound so good! They all look delicious but I think I would try the peanut butter blossom chex mix first. Thanks for the chance to win!! I love Chex Mix! The Sweet Pecan sounds amazing! Oh I think I'd try the Sweet Pecan and then the Sugar Cookie! Thanks for the chance to win! peanut butter and chocolate, how good is that?! The sweet pecan chex mix sounds very yummy! Oooh, I would definitely go with the Peanut Butter Blossom! Love peanut butter! I have been planning on making chex mix for gifts this year. The Peanut Butter Blossoms Chex Mix sounds really good. Peanut butter and chocolate together, who could resist! I'm definitely going to be trying out the gingerbread mix! would totally try the sugar cookie one first! YUM! I think the sugar cookie one sounds great! Sweet Pecan, without a doubt. GF and sounds great. I have been looking for a mixing bowl like the one you have pictured here. What brand is it? The iced pumpkin chex mix for sure! I would definitely make the Sweet Pecan Mix since I'm in Texas and always have an overabundance of Pecans! I am going to try the Pecan Chex Mix. It sounds so Yummy!!! They all look too good. I'm having a hats time deciding which one I'd like to make... Sweet Pecan sounds so yummy but then so does Sugar cookie. I'll have to try both! I can totally share with my GF friend as a surprise. Yay! I'm going to try the peanut butter blossom first! I love the taste of sweet peanut butter and chez mix is a great no-fail snack or gift! Thanks for the great ideas! Because we're big pecan fans, I think I'll make the Sweet Pecan. I'd go for the sugar cookie flavor. We love chex mix. I will be trying both recipes and also making the traditional recipe. Thanks for new ideas to try. With 'my' household divided, I'm afraid I'd have to do 'both' recipes. No way around it 'here', lol. However...my own personal favorite would have to lean toward the "Pecan Mix". Since I obviously can't read, when I first saw the post I thought it was going to be a recipe containing both pecans and peanut butter. I'll admit, my heart might have skipped a beat! Once I read the entire post and realized my mistake the thought that making a combination of the two would be so bad came to mind. So, honestly, I'd probably and up playing around with it with and mixing there that sound most like what I like.. The pecan and peanut butter ones. Oops sorry about all the typos in my previous response! That's what I get for using my phone to post! The sugar cookie one sounds fabulous! I would make the Peanut Butter Blossoms! The sweet pecan chex mix would be my choice. From the ones you listed I would love to try the Sweet Pecan Mix. I looked on the Chex website and found the Black Forest Mix that sounds great too! The sweet pecan sounds yummy!! I definately want to try the Sweet Pecan recipe and I love your website. I would make Gingerbread Chex Party Mix. That is my favorite spice. I would make the Peanut Butter Blossoms! My son loves peanut butter anything!!! I would make the Sweet Pecan. My grandmother loves anything sweet and with nuts, so I'd mail some to her for the holiday and to let her know we're thinking about her! I can't choose, will have to make them both. I love Chex Mix! I really want to try the Sugar Cookie one. We love peanut butter and chocolate! The iced pumpkin mix!! Yum!! All the Chex Mix recipes sound soooo good - but I'd definitely make the Peanut Butter Blossom mix first...it's been a favorite cookie for years! Thanks for the chance to win, and Merry Christmas, Tina! I would love to try the Gingerbread Chex Mix. My family loves those flavors this time of the year. I would make the Sweet Pecan Chex Mix! Thanks! I would make the Peanut butter blossom chex mix. My family is crazy over Peanut butter! The sugar cookie chex mix sounds delicious! We will definitely start with the Iced Pumpkin Chex mix. What could be better than Cinnamon Chex, Pumpkin and Cream Cheese. My grands will love this one. Of course, while we are in the kitchen we'll have to mix up some gingerbread and sugar cookie too! After all it only takes minutes to prepare these yummy nutritious snacks. Thank you to Mommy's Kitchen and Chex for the great ideas. The sugar cookie one sounds yummy, I tried a chex mix i got the other day it was sooo good, it was Cookies n' Creme! Looks like ill be making the Peanut Butter Blossums mix! They all sound yummy but I'll start with the sweet pecan. The peanut butter blossoms party mix. Mmmm.... I would make the sugar cookie chex mix. I did just make the white fantasy clusters from their website to give as gifts this year. Tina I will be making the peanut butter blossom chex. My niece is living with us while she attends college and she loves everything peanut butter. This will be a perfect snack while decorating the tree this weekend! Peanut Butter Blossoms will be the one I will make. My husband lives on peanut butter. Definitely the Peanut Butter Blossoms. Peanut butter is ALWAYS a winner in our house!! Mmmm....Sugar Cookie. That sounds delicious!!! Mmmm! I love Chex Mix, but the original flavor is still my favorite. However, the peanut butter one is awfully tempting! I think the sugar cookie one sounds divine! Thanks for the chance to win. is one that is lemon. YUM. 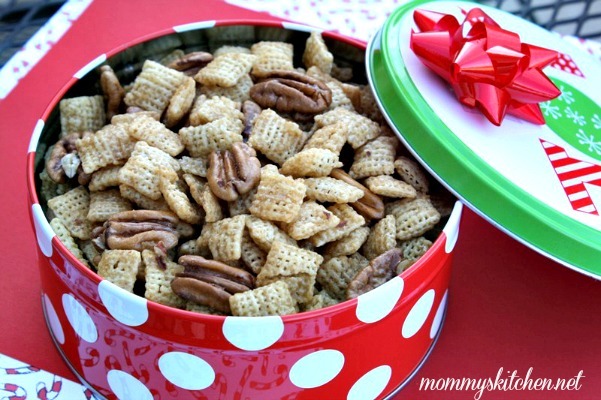 Sweet Pecan Chex Mix even sounds delicious!! Would love to make some for the holiday get-togethers. The peanut butter blossoms is the new one that I'll be trying this year especially! I would love to make the Peanut Butter Blossom Chex Mix. Thanks for the chance to enter. I'd like to make the Gingerbread variety. Thanks for the great giveaway! The peanut butter blossom choice is definitely the one for us as my husband is a peanut butter nut! I would make the Sweet Pecan Chex Mix....I love pecans....ciao4now64 at yahoo dot com. I think Sugar Cookie takes "the cake". But I've recently learned to like nuts so I'm eager to try Pecan, yet Peanut Butter is my favorite everything. Sheesh, the choices are too difficult! I'm going to make the Sweet Pecan Chex Mix for my brother and BIL. I had planned on making sugared pecans for them anyway and this will be something new for them this year. Hi,I would for sure try the sweet pecan chex mix.It sounds so good.. I would make the Peanut Butter Blossom Chex Mix recipe. Sounds great! I would make the Peanut Butter Blossoms & Sweet Pecan Mix. I would choose the gingerbread one. I would try the gingerbread mix. Sounds yummy! I am going to try the peanut butter blossom and the gingerbread! What a "sweet" thing to do! I'm anxious to try the Sweet Pecan Chex Mix. I just think pecans make everything a little better. Marry Christmas to you and God's blessings sent your way! Definitely the Sweet Pecan mix! Love pecans! Thanks for chance to win. I must try the Chili Lime and the Buffalo Chex mix. And one of my most favorite holiday treats is Cranberry Orange Bread so I just must try the Cranberry Orange Chex Mix as well. The Peanut Butter Blossom mix you spoke of looks awesome too. I love the original and make it every year. For a new one, I would try the Pecan one. I would make the sugar cookie variety! Oh my goodness, such a decision but think that I'd have to make the Peanut Butter Blossoms first, then the Sweet Pecan Chex Mix. Thank you for this chance to win a nice prize package. Peanut Butter Blossoms are our favorite cookie around here, so the Chex Mix should be awesome! I would make the sweet pecan because you say it takes like butter pecan and that is just a little bit of heaven! I think all the family that's going to get mixes would love it. I'd like to try the Ice Pumpkin Chex Mix as I love pumpkin cookies. I am going to try the peanut butter first-my kids love peanut butter, but I am sure I am going to have to try all of them thanks for the recipes!!! I am definitely making the Peanut butter Blossom first!! Chocolate and peanut butter with a Chex Mix crunch sounds like little bites of heaven to me! I would make the sugar cookie check mix first. They all sound great though. Hi! I would definitely try the Sweet Peanut Butter Blossoms Chex Mix. It sounds yummy! Thanks for the recipes. Mmmmm, definitely want to make the sweet pecan Chex mix! Looks delicious! ALL OF THEM :) I have been looking for something diferent from the other chex snacks for Christmas gifts to give this year in the empty popcorn containers I have accumulated over the years.These will make the perfect combo. I would make the Gingerbread Mix. I love anything gingerbread, so I'm sure this would be amazing. Thanks and Merry Christmas! would love to try the Peanut Butter Blossoms Chex Mix recipe! Thanks! All the mixes sound delicious, but I think I would start with the Pecan one. Sweet Pecan sounds good- but my boys are big fans of traditional party mix!! They all sound so yummy! I would start with the Peanut Butter Blossoms party mix! I love peanut butter and chocolate together! Merry CHRISTmas! The Sugar Cookie Chex Party Mix sounds good...I love already making Muddy Buddies every year so that may be a good one to add to the mix. Thanks for this opportunity. I would like to try the Iced Pumpkin Chex Party Mix and it would make great gifts! Toss up between sugar cookie & peanut butter blossom. I think I would try the sugar cookie flavor. I would make the sweet pecan flavor. I want to try the gingerbread version - that sounds delicious! Chex mix is always a staple for holidays at our house. Mmmmm Peanutbutter Blossoms! Sounds really yummy! I love pecans so it would be Sweet Pecan! iced pumpkin for me please!! I want to try the Sugar Cookie Chex Mix! I would try the Sugar Cookie one--that sounds awesome! Thanks for the opportunity and thanks for your wonderful recipes!!! The peanut butter blossoms chex mix sounds great to me! My husband is a huge pecan fan so I would have to go with the Sweet Pecan. The peanut butter one would be a hit here! I like Chex Mix just fine, but my husband LOVES it! I think his favorite is slightly spicy with peanuts. My preference is plain without peanuts. Of these two, I'd have to go with the peanutbutter blossoms. I think we'd both like them! I am definitely trying the Pecan Chex Mix. The maple syrup sounds like a delicious ingiedent. I think I would like to try the gingerbread chex mix, sounds yummy! Mmmm.. I would make the sugar cookie variety. I am very into gingerbread this holiday season. The peanut butter, for sure! I just found your website and have spent lots of time scrolling through all your recipes tonight! 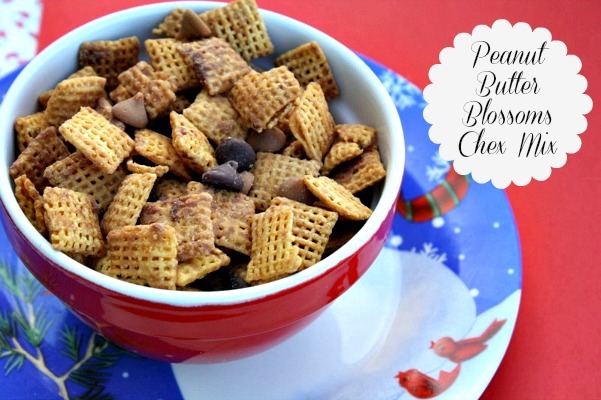 I LOVE peanut butter, so I think I'd have to make the peanut butter blossom Chex Mix. I love Chex Mix!! I think I would try the Sweet Pecan or the Sugar Cookie Chex Mix. They all sound good. Thanks! Sweet pecan, but for one of my favorite boys who has a nut allergy I will just leave out pecans in his! It would be the Sweet Pecan for sure. I love pecans and that one would be what I'd enjoy. The winner is listed in the post. A winner of the Chex Party Mix Gift Box has been chosen. Congrats to Andrea D! Definitely the sweet pecan. Love the fact that it is gluten free. 1st the sweet pecan chex mix, but also like the sound of the peanut butter blossom! sweet pecan looks real good trying it first love your recipes.. They all sound great but I can't get the sugar cookie or gingersnaps ones to come up. The link goes to a triple berry recipe. A little help please.